The Department of Psychology is deeply saddened by the death of Edmund J. Fantino, Distinguished Professor of Psychology, Emeritus, who passed away September 22 in his home in Del Mar, surrounded by his loving family. Edmund had waged a valiant battle against metastatic prostate cancer since 1988, while continuing his productive career unabated during the entire 27 years of his illness. 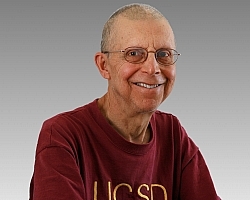 At the time of his death he had completed 48 years of service at UCSD. Edmund was born in New York City in 1939, the son of Italian immigrant parents. He was proud of his Italian heritage and frequently traveled to Italy to visit relatives. His initial education was in the public schools of New York City. His college education occurred at Cornell University, from which he earned his A.B. in mathematics in 1961. He received his Ph.D. in experimental psychology from Harvard University in 1964, a time when the behavioral psychology of B.F. Skinner was at its peak influence. Edmund was one of a cohort of brilliant students who shaped the development the new field of behavior analysis for the following five decades. While at Harvard he met and became friends with George Reynolds, one of the early members of the UCSD Department of Psychology, who later invited Edmund to join him at UCSD. At the time Edmund was an Assistant Professor at Yale University. He joined the faculty at UCSD in 1967. Throughout his long career, he was remarkably productive, authoring or co-authoring over 200 journal articles and book chapters, as well as three books. Even during the tightest budgetary periods he continued to garner the research funds necessary to support his large laboratory, supporting a continuous stream of excellent graduate students. Over the years more graduate students received their Ph.D.s under his tutelage than any other member of the Department. Edmund was known as an excellent teacher, in part because he incorporated behavioral principles into his class organization. He always received the highest CAPE ratings and was the recipient of teaching awards from several undergraduate colleges. Although Edmund's research spanned many different topics, much of it was organized by a general behavioral law for which he is best known - "the principle of delay reduction." Stated simply, it states that the value of a stimulus is determined by the time to reward signaled by the stimulus relative to the average time to reward in the situation without the stimulus. Thus, reinforcement is inherently relativistic, and cannot be predicted by absolute temporal parameters in themselves. This basic law of behavior continues to pose a major challenge for neurophysiological accounts of learning. His high level of productivity continued throughout his illness. One of his books, "Behaving Well: Strategies for Celebrating Life in the Face of Illness" expressed well his philosophy of life and how he managed his own behavior using the behavior principles he had studied throughout his career. The result was that he maintained a relatively normal life almost to the end. With his death the world has lost a true believer in a behavioristic psychology that permits its principles to be applied to the everyday problems of life - even the most difficult. Edmund is survived by his wife (and research collaborator), Stephanie Stolarz-Fantino, his two daughters, Ramona and Marin, and two grandchildren.